Causes of common medical conditions and how the kybun shoe can be used as a therapeutic and training instrument, are explained in the following medical indications. 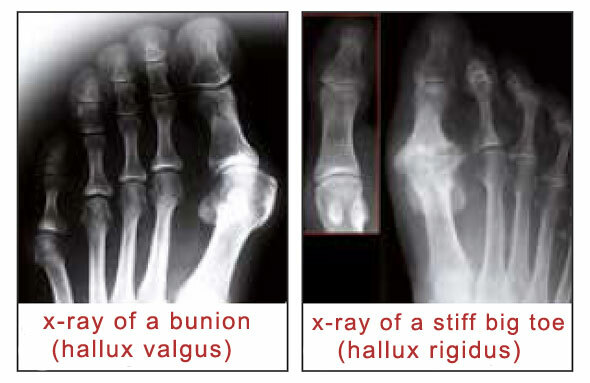 Hallux Valgus is a chronic crookedness of the first toe in the first metatorso-phalangeal joint. This incorrect position is either inherited or trained by overexertion (bad footwear, i.e. shoes that are too high or too tight). In therapy, foot gymnastics has proven valuable because the foot musculature must be strengthened. In addition, the person affected should avoid supporting and guiding shoes as well as orthopedic arch supports because these relieve and weaken the foot musculature. As a consequence, the Hallux Valgus becomes worse. The kybun shoe offers the foot sufficient space. The toes are not constricted and can move freely. Due to the supple air-cushion sole, the foot muscles are permanently activated and trained. After some time, the pain of the inflammation decreases because the musculature is strengthened and becomes more resistant. The training of the foot musculature by the elastic air-cushion sole can initially increase the inflammation because the musculature is strongly challenged. Therefore it is important that the training is planned individually. The customer should not stand in the kybun shoe for too long, but rather walk in it. When walking, a vigorously rolling foot motion needs to be avoided. Stepping down with the entire sole would be ideal. If the musculature is too weak or the customer has trained too much, temporary wearing of normal shoes is recommended (possibly even with the arch supports), i.e. the customer alternates between the kybun shoe and the shoes he has worn so far. For some customers the change between kybun shoe with arch supports and without arch supports is also advisable. Standing for too long must be avoided. Regular walking/training with the kybun shoe is important. However, training with the kybun shoe should never be done to the point of overexertion. At the beginning, the foot should therefore rest regularly in a normal shoe. The longtime goal is to wear the kybun shoe as an everyday shoe. first metatorso-phalangeal joint and therefore diminishes the pain. This measure is counterproductive in the long run. After some time, the first metatorso-phalangeal joint reacts even more sensitive to movement and as a consequence hurts even sooner. The arch support therefore also creates compensatory movements when walking. The foot does not completely execute the rolling motion. Instead the motion is compensated for in the knee and partly transferred to the other side so that the other joints can become overexerted. For existing orthopedic problems, the three basic exercises to strengthen the musculature should be done regularly. The chronic inflammation of the Achilles‘ tendon is a consequence of over stress. Very often it occurs to athletes, mainly runners and football players, due to incorrect stress or overexertion. 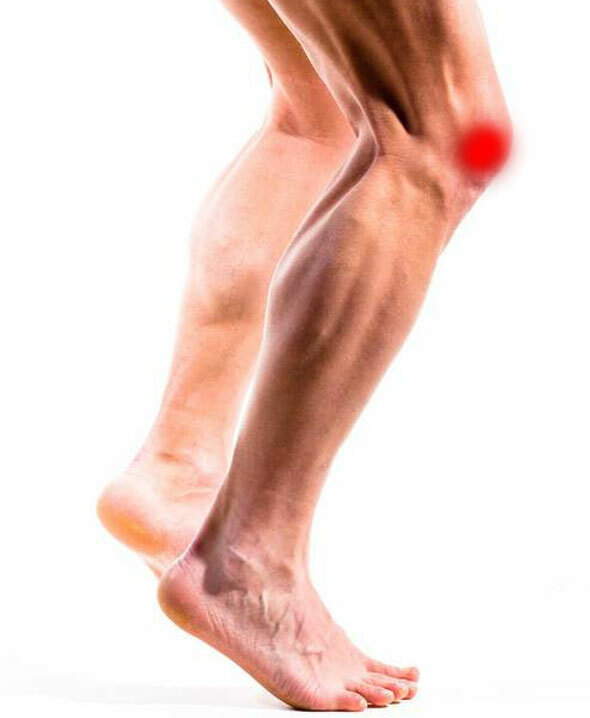 For non-athletes inflammation of the Achilles tendon occurs due to relieving postures. When a person has knee pain, this knee is unconsciously relieved, the other side over stressed, and in that way an inflammation of the Achilles tendon is often triggered. Relieving postures also always occur by back pains or foot problems. It is important not to change into normal shoes as long as the inflammation of the Achilles tendon still exists. The customer should wear the kybun shoe all the time because in normal shoes the tendon is irritated again and again and the inflammation cannot subside. Varicose veins are veins in which the venous valves are insufficient. Venous valves are particularly numerous in those veins in which the blood must be transported contrary to gravity (e.g. in the legs). Venous valves act like a valve and are responsible for the blood flowing towards the heart. As the blood flow in the veins mainly takes place through forces from outside veins (contractions of the musculature) the venous valves are also responsible for the blood not to flow backwards during resting periods but is transported, step by step, towards the heart. Through frequent sitting and incorrect walking, the venous blood is not pushed upwards sufficiently and the weight of the blood destroys the venous valves. When walking, the veins are squeezed more, the harder the foot motor is working. When the ankle is active, the muscular pump of the lower leg musculature is at work. The venous tubes are squeezed and the blood is pressed upwards. When walking in supporting, guiding shoes on flat surfaces, the motion of the ankle is limited and therefore the activity of the muscular pump is also reduced. When standing on flat surfaces, the muscular pump is hardly working either. The weight of the blood pushes the venous valves through and produces varicose veins. This can be thwarted when the foot motor is activated by walking on elastic materials, such as e.g. on the kybun sole. Thereby the muscular pump is vigorously activated and the venous blood forcefully pumped towards the heart again. The lower leg musculature is constantly moved whereby pumping the venous blood upwards and relieving the veins. This not a cure for varicose veins, rather the pressure on the remaining functioning veins is better distributed, though. This way the veins are relieved which counteracts the development of new varicose veins. The spinal column is a very complex construction. It consists of 24 vertebrae. Facet joints join the vertebrae, transverse processes at the thoracic spine join the spinal column with the ribs of the thorax. The inter-vertebral discs between the vertebrae are very flexible and resilient. The ligaments join the bones and guide the movements. Many small and large muscles move the spinal column. 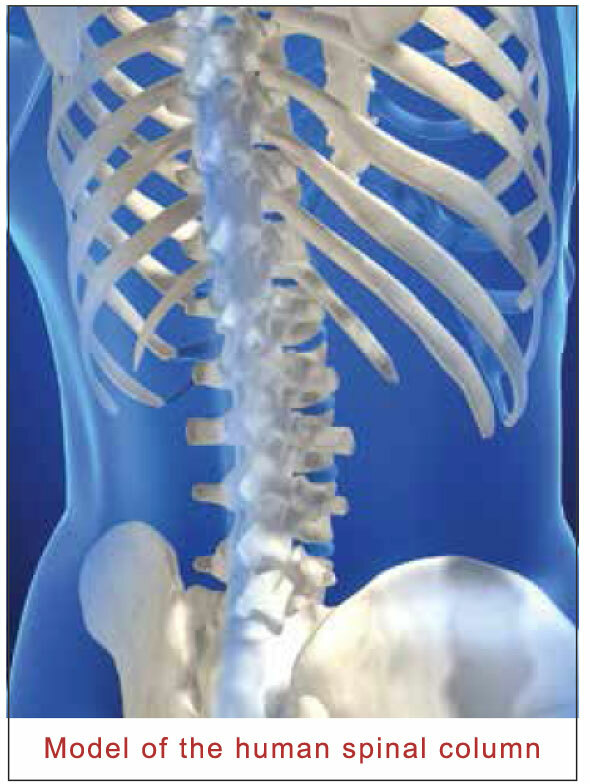 The main function of the spinal column is the facilitation of motion and the protection of the inner organs. Back pains signal that tension pulls the highly complex structures of the spinal column into malpositions. Due to the malpositions, the nerves which are sending pain signals to the brain, are irritated. the bending posture of the back is increased. Bending forward of the spinal column has the consequence that the center of gravity of the body falls forward thereby lengthening the step. More hip activity develops. The hip flexors are strengthened even more, the back thigh musculature and also the deep abdominal muscles are relieved which leads to a vicious circle of even more relieving and bending. The forward relieving posture is complemented by a side way relieving posture because the left and the right sides of the human body are asymmetrical. The left or the right side additionally goes into a relieving posture, which leads to a contortion in the pelvic area. Tensions develop through bending, incorrect and relieving postures, muscle imbalances, and shortening of various muscle groups. These muscular problems can be improved or even solved by movement. The more optimal the quality of the movement is, i.e. the more accurately the movement is scurried out, the better the muscular problems are solved. Correct movement means walking, very light jogging (trotting), or even better, a change between walking and trotting. Hereby it must be noted that the body is in a stretched posture and does not fall into a relieving posture. A lopsided strain (e.g. limping) and bending are to be avoided. Since the kybun shoe does not limit the mobility of the foot, but gives it the entire freedom to move, these unlimited movements also continue in the joints (e.g. hips). The spinal column straightens itself; the joints are more ideally placed on top of each other. The most common reasons for back pains are malposition and muscle weaknesses due to overexertion of the musculature. With the kybun shoe, these can be solved. By loosening the musculature, the pain can be relieved most of the time. The transition from supporting, guiding shoes to the kybun shoe can trigger initial reactions due to the change from a relieving posture (bending) to a pressure posture (stretching). This can result in the body being over strained because of the corrected posture (e.g. stretching of the hip flexor, stretching of the lumbar spine) at the beginning. As a consequence there can be pain. Therefore it is important to build up the training individually. The customer should not stand too long in the kybun shoe, but rather walk, maybe even alternate between trotting and walking. Before wearing the kybun shoe in everyday life, it is recommendable to build up the musculature with specific exercises. There are three kinds of knee pain, e.g. meniscus and patella fiber problems and arthrosis. These are wear marks on the knee, which are a consequence of longtime misapplied force on the knee joint. These misapplied forces occur when civilized man moves on hard, flat surfaces. Wearing shoes with heels leads to passivity of the foot. When walking on hard, flat surfaces most people take unduly long steps. This irritates the knee joint because the foot does not actively take on the forces but stressing shear forces impinge on the knee joint. Often the knee is additionally burdened because the untrained feet have the tendency to buckle inwards so that the lateral axis is inaccurate. Therefore the meniscus is overloaded or the patella fiber is irritated. The longtime effect of knocks on the knees is arthrosis. Would man not walk in supporting, guiding shoes on hard streets and hard surfaces but always walk barefoot on meadows, the musculature of the foot as well as the lower leg and thigh area would be trained with every step. The musculature would work as an ideal shock absorbent and the length of the steps would become shorter. The foot would play a more active role in the movement and therefore mainly work as a shock absorbent for the knees. A trained foot tilts to the inside less. It moves physiologically correct, i.e. the foot performs a rotating movement. This starts at the outside of the heel area and ends with pushing off over the first toe. Hereby the knee is optimally stressed. The elastic kybun sole between the foot and the hard ground enables an active movement of the foot. The musculature is evenly trained and works as an optimal shock absorbent. When changing from a supporting, guiding shoe to the kybun shoe, initial reactions can occur because the weakened foot now stands on an unstable air-cushion. The entire system can be unstable for a moment so that additional stretching stimuli, due to over stress of the foot and leg musculature, can impact on the knee. Even when the pain subsides after wearing the kybun shoe, it is important to limit the time of use at the beginning because extended wearing can cause overexertion which can lead to pain after some hours or even the following day. The training should be slowly increased, i.e. the customer should wear the kybun shoe 2-3 times a day and take it off when pain or irritations occur. The main reason for tension in the neck is a monotonous, incorrect seating posture. Due to a rounded back, head and shoulders glide forward. The back and neck musculature is over stressed and becomes tight because it must constantly work against gravity. As there are many shoulder muscles which lead into the head, this can cause headaches. The most important measure is the reduction of ‘sitting times‘ to avoid monotonous postures. Many tasks can be dealt with while actively standing on kybun shoes, e.g. office work at a high desk, making phone calls or preparing meals. The correct posture is automatically taken up on the elastic sole. 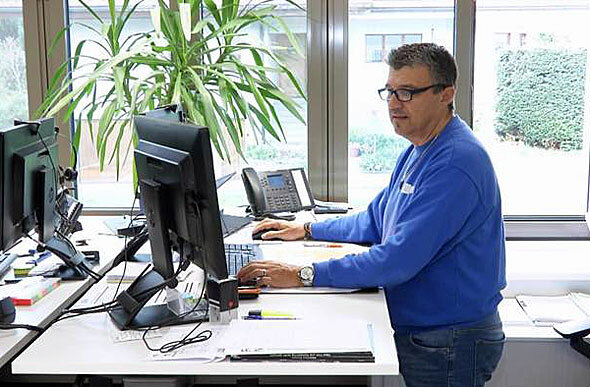 It is important to pay attention to the height of the high desk so that the shoulders are loose when working at the computer. The arms are on the table at a 90 degree angle when writing with mouse and keyboard. The monitor is positioned so that the eyes are looking straight ahead or slightly downward at the monitor. Click here to find out what kybun customers are saying!